In the mid-1960s, the idea to construct schools to provide students with training in vocational and technical trades was born in the Florida Legislature. Realizing there was a need for specialized training for those students who were not college-bound, the legislators fixed the necessary appropriations to build schools to provide that training. Citrus County was notified of a $325,000 allocation for a technical school based on certain requirements, one of which was the community’s willingness to forgo localized plans and include other counties in the overall planning. With a June 1st deadline looming and unable to contact the superintendents of Hernando, Marion, and Sumter counties to discuss plans for the school, then-Superintendent James McCall reported in late May to the Citrus County School Board that the outlook for a community vocational school looked poor. Board Chair Betty Williams, alarmed by the possible loss of opportunity, moved that McCall telephone the Hernando County School Board chair immediately to set up a meeting as soon as possible, which he did during the open meeting. Citrus Board members Betty Williams, Phil Zellner, Horace Allen, Walter Bunts, and Richard Kaufman, accompanied by Senator James E. Connor, met with the Hernando County School Board the very next night. The Hernando County Board agreed to participate in Citrus County’s plans for a vocational technical school, but only to the extent of encouraging adult students to attend the new facility. Immediately after the meeting with the Hernando County Board, the Citrus County Board convened in Inverness, where they agreed to apply for the allocation set up by the State. The other two counties came on board in a similar fashion. A parcel of land for the school site was offered by John Eden, Jr. but the State declined the offer, citing the proximity to a railroad track. Board member Richard Kaufman believed the ideal location was a tract of Withlacoochee Forest land near the intersection of US 41 and State Road 44. Consisting of 40 acres, the tract was at that time under lease to the City of Inverness from the Forestry Service for an intended outdoor recreation area. The Inverness City Council agreed to relinquish the lease for the sake of building the school. 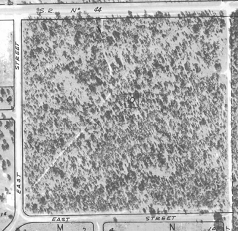 Mr. Kaufman, with the assistance of School Board attorney William Edwards, then negotiated the purchase of the land for $300 per acre. 1966 aerial view of the tract that would become the school campus. State Road 44 is at the top of the picture. By August 1967, architect James Page was hired to design the school. In rapid succession, Carl H. Rehwinkel was selected as the overall Director of the school, bids were solicited, construction undertaken, the name Withlacoochee Vocational Technical Center(WVTC) selected, programs designated, employees hired, and students registered. The doors opened to students in the fall of 1968. 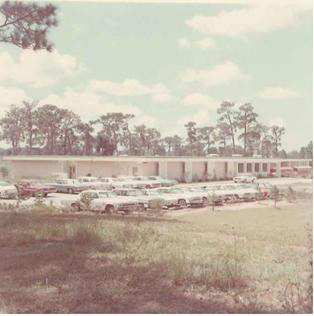 Initially a small building (just a portion of the current 100 Building) was constructed and housed the first program offerings: Automotive Body Repair and Refinishing, Automotive Mechanics, Business Education, Cosmetology, Distributive Education, and Horticulture. Rapid population growth and increased community demands required WVTC to expand not only program offerings but expand current buildings and construct additional ones to house them. By 1979, three additional construction projects had increased the school’s footprint. Programs in the areas of criminal justice, nursing and healthcare, welding, construction trades, and culinary arts were added. WVTC parking lot looking west from Montgomery Avenue showing the original building, circa 1969. In 1984, WVTC merged with the local Adult Community Education Center (whose building was on the school campus) and the Learning Resource Center, which opened in 1975 as the result of projects conducted by the US Department of Labor. Emerging as one entity named Withlacoochee Vocational and Adult Education Center (WVAEC), the school continued to expand its offering of training programs, including subdividing the Business Education program into Bookkeeping and Secretarial/Clerk Typist. A major expansion occurred in the early 1990s, when the current 200 Building was added, increasing the total square footage by 66,000 to 164,000. In 1992, with the curriculum of the school becoming more technical in nature, a name change was affected and the school became known as Withlacoochee Technical Institute (WTI). Additionally, Marine Mechanics Technology and Early Childhood Education programs were added in 1994 and Air Conditioning and Refrigeration was added in 2000. The most recent addition to the campus is a free-standing Media Center, which was originally housed in the 100 Building. The Media Center opened for student use in 2002. As the new century progressed, health science programs increased to include Medical Administrative Specialist. Industrial Machinery Maintenance was added in 2009 and in 2010 the school added a Solar Thermal System Design, Maintenance, and Installation course to meet the increased interest in alternative energy. An Automation and Production Technology program was added in 2013. The Information Technology career cluster increased with the addition of the Applied Cybersecurity program which was added in the fall of 2016. By 2014, a renewed nationwide need for vocational and technical education (now known as career and technical education) led school administrators to determine a new name and image were vital to the school. Consequently, in October 2014 the Citrus County School Board and the Commission of the Council on Occupational Education approved a request to change the institution’s name from Withlacoochee Technical Institute to Withlacoochee Technical College (WTC). Since 1968, regardless of the name used or what programs have been offered, WTC has risen to the occasion, providing the highest quality in workforce education to the citizens and employers of Citrus County and the surrounding counties of Hernando, Marion, and Sumter. Moving forward, the staff and leadership of WTC pledge to continue this tradition. Land, Bell. “Vo-Tech School Built of Need and Cooperation.” Citrus County Chronicle, 14 Nov. 1968.